The Aprilaire Model 8444 Thermostat offers the benefits of bringing your heating and cooling system into the digital age, while being extremely easy-to-use. 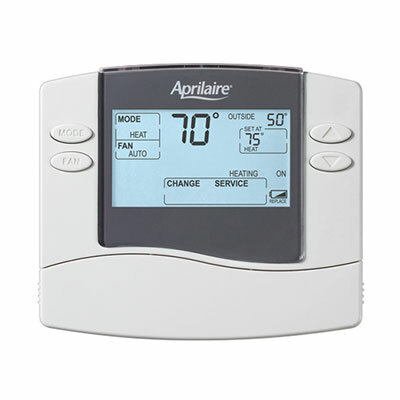 If you don’t need a programmable thermostat, but desire digital accuracy and the convenience of an electronic over a mechanical thermostat, then the Aprilaire Model 8444 Thermostat is the best choice for your home. Simultaneous display of room temperature, temperature setting and outdoor temperature, in Fahrenheit or Celsius. Service reminders for your HVAC system, humidifier, dehumidifier and air filter. Protects your equipment and ensures the longevity of your investment.